The JUNO Awards are heading Western's way. For the first time since the award show began touring across the country in 2002, London, Ontario will host The 2019 JUNO Awards along with all JUNO Week festivities, March 11 – March 17, 2019. 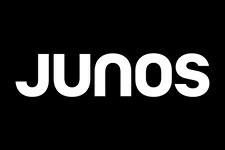 The 48th Annual JUNO Awards will be broadcast live on CBC from Budweiser Gardens, on Sunday March 17, 2019. Several JUNO nominees, winners and past judges are connected to Western - as alumni, faculty and students. Check out our list here and if we've missed anyone, please contact Rachel Condie, Marketing and Communications Coordinator for Western's Don Wright Faculty of Music, at rachel.condie@uwo.ca. Also nominated in 1990 for his composition Sonata No. 1, The Penitent for violin and piano. The Canadian Chamber Choir (CCC) was nominated for the 2016 JUNO. Julia is a founding member and artistic director of CCC. The nomination was for their second CD Sacred Reflections of Canada: A Canadian Mass in the category of Classical Album of the Year: Vocal or Choral Performance. The album features 17 Canadian composers whose works were curated by Davids. Leader of the indie folk band Great Lake Swimmers, he has also released two solo albums. Featured on the Canadian Chamber Choir album, nominated for the 2016 JUNO Award. Awarded the national 2018 MusiCounts Music Teacher of the Year award. As part of the award, Matthie received a JUNO Award and a trip to the 2018 JUNOS, and was also invited to the 2018 CCMA awards. Principal keyboard player for Tafelmusik since 1980. Jayme Stone's Folklife, a group he plays bass and sings with, was nominated for a 2018 JUNO album of the same name, in the category of "Traditional Roots Album of the Year". Jayme Stone’s Lomax Project was also nominated in 2016 (Traditional Roots Album of the Year category). Don Wright Faculty of Music members (and London Symphonia members) Joseph Lanza (violin) and Ron George (horn) - both performed with Tafelmusik Baroque Orchestra and Chamber Choir in the 2017 JUNO nominated classical award Beethoven Symphony No. 9 on the ensemble’s nominated Classical Album of the Year: Large Ensemble or Soloist(s) with Large Ensemble Accompaniment.